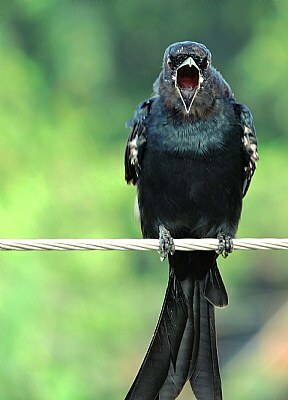 About A Black Drongo opening his beak wide while I clicked the guy. Thanks a lot Dolle for your visit. Thanks a lot Riny for your visit. Gongrats for double Awards Ayan..Perfect! wooow impressive and best congrats for the double award received ! Glad you like it Bruce. Thanks for your visit. Thank you once again Salvador. Congratulations again, Ayan. Now for the well deserved awards. I am very glad, my friend. Thank you once again Sreeradha. congratulations for the double award. He is telling you that he didn't give you permission to take his picture. He hates paparazzi. Thank you Jill for your constant appreciation. Glad you like Nigel, thank you very much for visiting. I'm pleased that you like. Thank you very much Radovan for your visit and comment. Perfect timing Ayan,great capture and well deserved awards. Thats a great moment that you captured . Thank you very much Paul for visiting and commenting. It does look like he was putting up a bit of a protest. lol You did an excellent job with the lighting and details in this tough shot. I can never quite get it right.